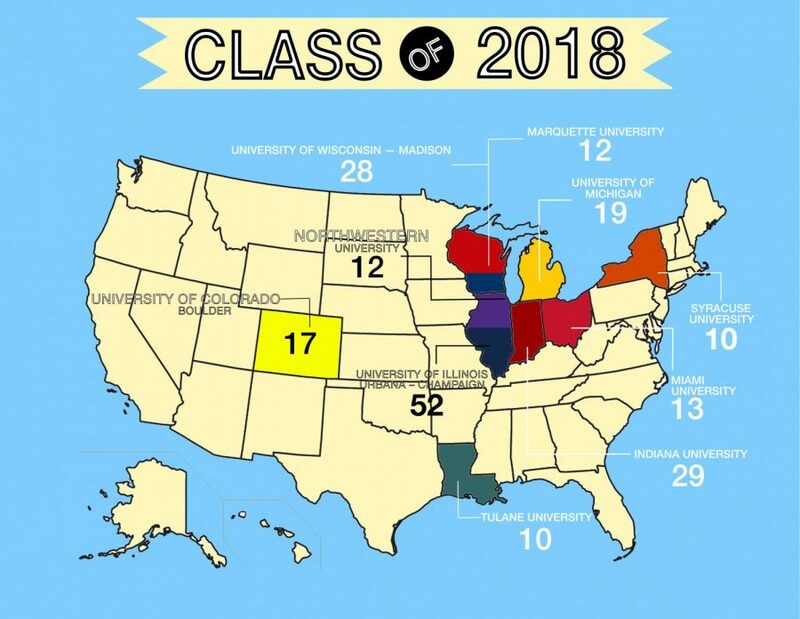 Emily Abt – McGill U.
Emerson Adams -Texas Christian U.
Jude Al Abosy – DePaul U.
Caroline Alcock – Marquette U.
Josh Alter – Syracuse U.
Ralitsa Angelova – Purdue U.
Jaine Archambeau – Columbia U.
Joey Artinian – Marquette U.
Ben Axelrod – Indiana U.
John Baird – Michigan State U.
Aviv Barad – The George Washington U.
Kate Barbin – Butler U.
Katie Bauer – Elon U.
Tony Bayvas – Northwestern U.
Gretchen Beatty – Butler U.
Bibiana Belknap Fernandez – Boston U.
Caroline Bercu – Tulane U.
Alex Bernardo – Loyola Marymount U.
Matt Bilas – Boston U.
Annie Bingham – Brigham Young U.
Nicole Blesi – Fordham U.
Charlie Blomberg – Virginia Polytechnic Institute and State U.
Mulan Blum – The Ohio State U.
Jason Born – Denison U.
Peri Box – Indiana U.
Serena Braun – Illinois Wesleyan U.
Jason Brickman – Emory U.
Anna Brooks – Bucknell U.
Isabelle Bryla – The Ohio State U.
Sarah Buchmann – Illinois Wesleyan U.
Benji Buckner – High Point U.
Payton Burch – Denison U.
Abigail Burke – Iowa State U.
Olivia Burnside – Denison U.
Allie Caldwell – Indiana U.
Peter Chatain – Stanford U.
Jeffrey Chen – Brandeis U.
Rachael Chiao – Boston U.
Elliot Chow – Northwestern U.
Alex Chvala – Tulane U.
Andrew Clark – Coastal Carolina U.
Kevin Conaghan – Marquette U.
Anabelle Conley – Indiana U.
Jack Connolly – Tulane U.
Ana Cornell – Northwestern U.
Michael Cothran – Bradley U.
Dylan Cotter – Santa Clara U.
Zachary Crispino – Cornell U.
Elly Cudmore – Georgetown U.
Emily Curylo – Illinois State U.
Nicholas Curylo – DePaul U.
Kevin Day – Vanderbilt U.
Chris DeLeo – North Carolina State U.
Anna DeNunzio – Michigan State U.
Alex DeTrempe – Southern Methodist U.
Frances Dolan – American U.
Daphne Donnelly – Marquette U. Grace Caoilin Donnelly -New York U.
Alex Donnelly-Maine – Indiana U.
Payton Dooley – Saint Louis U.
Jackson Dugan – Santa Clara U.
William Dugan – Furman U.
Tori Edington – Princeton U.
Olivia Eisen – The Ohio State U.
Michelle Ellis – Colorado State U.
Nick Falter – Indiana U.
Courtney Faurot – Michigan State U.
Hannah Fergus – Florida Gulf Coast U.
Michael Ferguson – Pepperdine U.
Morgan Fisher – Lawrence U.
Victoria Flannagan – Baylor U.
Andrew Fortin – Northwestern U.
Michael Franczek – Michigan State U.
Isabella (Izzy) Gagliardi – Elon U.
Matthew George – Marquette U.
Caroline Gibson – Indiana U.
Kathryn Gibson – Indiana U.
Sophia Girgenti – Johns Hopkins U.
Sarah Goff – DePauw U.
Katie Gold – Colgate U.
Lisa Gong – Cornell U.
Torri Goss – Purdue U.
Charlie Grant – Southern Methodist U.
Ryan Gridley – Northwestern U.
Ayanna Guillen – DePaul U.
MacClement Guthrie – American U.
Tommy Hackley – DePauw U.
Jacob Hagist – Indiana U.
Elise Hall – Villanova U.
Mackenzie Hall – Santa Clara U.
Blake Handwerker – Northwestern U.
Taylor Hanlon – Baylor U.
Leopold Harris – American U.
Caroline Hartman – Northwestern U.
Sarah Hayes – Texas Christian U.
David Heiman – Syracuse U.
Eden Hirschfield – Northwestern U.
Jared Hoffman – George Washington U.
Sonia Holstein – George Washington U.
Avi Horwitz – Case Western Reserve U.
Evan Hummel – Syracuse U.
Jacob Imber – Georgetown U.
Olivia Ingle – Boston U.
Nikolai Jacobs – LeTourneau U.
Isabel James – Texas Christian U.
Sophie Jednorowicz – Chapman U.
Dina Kacila – Saint Louis U.
Thomas Kahler – Colorado State U.
Kelly Kang – Villanova U.
Annie Kaplan – Vanderbilt U.
Max Kaufman – The Ohio State U.
Cullen Kavanaugh – Syracuse U.
Lanie Keller – Michigan State U. Will Kerpan – DePaul U.
Katie Kessler – Illinois State U.
Parker King – Utah State U.
Frank Klapperich – Marquette U.
Jamie Kohr – Northwestern U.
Michael Kolovos – American U.
Alexandre Kulp – Marquette U.
Andrew LaCava – Wake Forest U.
Frances Lafontant – Tulane U.
Charlotte Lane – Villanova U.
Olivia Lantry – Denison U.
Marisol Lariviere – Yale U.
Allie Larkin – Saint Louis U.
Luke Lato – The George Washington U.
Jacob Levy – Cornell U.
Juliette Lewis – Auburn U.
Ben Lissner – Boston U.
Luke Litowitz – Northwestern U.
Alex Look – DePaul U.
Lizzie Lyons – Texas Christian U.
Kate Macakanja – Princeton U.
Louie Madanguit – DePaul U.
Riley Maher – Indiana U.
Gaby Malnati – Santa Clara U.
Nell Martin – Villanova U.
Chloe Mathias – Elon U.
Carla McCanna – Loyola Marymount U.
Jack McKenzie – Syracuse U.
Merryn McKeough – Emory U.
Mia Melchiorre – Indiana U.
Sofia Mena – New York U.
Leah Merrill – Brigham Young U.
Jack Mestanas – Xavier U.
Matt Metrick – Tulane U.
Nicole Metropoulos – Indiana U.
Leigh Meyer – The George Washington U.
Emma Michelson – Syracuse U.
Greyson Miller – Illinois State U.
Rebecca Miller – Tufts U.
Kylie Moore – Santa Clara U.
Charles Morgan – Denison U.
Matt Mosher – Indiana U.
Allen Moy – Marquette U.
Rita Murphy – Lawrence U.
Joseph Musolino – Lehigh U.
Kian Nematollahi – Marquette U.
Anthony Nicholas – Marquette U.
Griffin Norton – Texas Christian U. Will Nummy – Illinois Wesleyan U.
Laura Nusekabel – Colorado State U.
Mary O’Brien – Marquette U.
John O’Keefe – Wake Forest U.
Liam Oh – Northwestern U.
Andrew Olson – Cornell U.
Emma Olson – Michigan State U.
Josephine Olson – Boston U.
Kelly Olvany – Colgate U. May Paddor – Tulane U.
Gia Palacios – Marquette U.
John Papas Dennerline – Purdue U.
Seoyeon Park – Northwestern U.
Sydney Parker – DePaul U. Will Parris – Drexel U.
Eleanor Pass – The George Washington U.
William Pass – Denison U.
Megan Patterson – Texas Christian U. Drew Patton – Purdue U.
Jason Paul – Northwestern U.
Piper Phillips – Indiana U.
Nicole Pofcher – Stanford U.
Rachel Price – Syracuse U.
Hank Rahaley – Colorado State U.
Sophie Randle – Texas Christian U.
Alexia Raucci – Arizona State U.
Maisie Reardon – Saint Louis U.
Cam Redding – Saint Louis U.
Elise Reehl – Boston U.
Max Rezek-TeWinkle – Indiana U.
Sabrina Rice – Denison U.
Sara Richman – Indiana U. Grace Robinson – Fordham U.
Patrick Rocap – Santa Clara U.
Olivia Rocklin – New York U.
Graham Rodes – Boston U.
Amia Ross – Harvard U.
Trevor Rowland – Iowa State U.
Carolyn Roy – Valparaiso U.
Kathryn Roy – Valparaiso U.
Sam Rutherford – Butler U.
Sophie Sain – Wake Forest U.
Matthew Samuelson – Marquette U.
Jarett Sanchez – Marquette U.
Emma Santiccioli – Indiana U.
Matthew Schaum-Rivera – Bowling Green State U.
Hans Schmit – Indiana U.
Remi Schreder – Santa Clara U.
Carolyn Schwartz – Colorado State U.
Kailyn Scobie – Butler U.
Gwyn Scrine – Indiana U.
Natalia Semaniuk – Depaul U.
Maggie Seymour – Butler U.
Chris Shelton – Tulane U.
Lexi Shoup – The Ohio State U.
Sam Shrier – Southern Methodist U.
Skylar Shvartsman – Saint Louis U.
Eva Silberman – Hamline U.
Vivienne Sleigh – Colgate U.
Carter Slivka – Purdue U. Drew Smith – Butler U.
Meghan Smith – Tulane U.
James Snyder – Indiana U.
Elaine Sowlat – Clark U.
Lucy Spahr – Cornell U.
John Spaulding – Boston U.
Ilana Spitz – Tulane U.
Milena Srivastava – Michigan State U.
Hannah Stein – Brandeis U.
Loren Steinberg – Santa Clara U.
Olivia Stensberg – Texas Christian U.
Matt Stetter – Syracuse U.
Spencer Stilp – Texas Christian U.
Ian Stone – Denison U.
Kara Struckman – Georgetown U.
Elli Sweet – Georgetown U.
Zoe Swoish – Indiana U.
Michael Tanaka – Lehigh U.
Jack Tangen – Lindenwood U.
Marty Tatosian – Indiana U.
McEan Taylor – McGill U.
Christian Tingle – Case Western Reserve U.
Annie Tobey – Denison U.
Colm Traci – Santa Clara U.
Brendan Traverso – Indiana U.
Eloise Trout – Lehigh U.
Megan Van Dusen – Syracuse U.
Nina VanPopering – North Carolina State U.
Charlie Vassallo – Tulane U.
Hank Walker – Indiana State U.
Simone Wall – Duke U.
Reilly Walsh – Northwestern U.
James Wasielewski – Embry-Riddle Aeronautical U.
Sophie White – Colgate U.
Joshua Wilens – American U.
Hannah Xu – Case Western Reserve U.
Julia Yang – Boston U.
Yasmine Yidiz – New York U.
Michelle Yurovsky – Depaul U.
Belle Zelazny – Michigan State U.